I wanted to create this page to share my opinion about a few romhacks of my favorite game, Super Metroid. If you’d like to try any of these, I suggest playing the original Super Metroid first, just to familiarize yourself with some of the nuances of the original. If you’ve played the original within a year, you should be fine. Also, please note that there’s a ton of Super Metroid romhacks available, but I don’t enjoy the ones that are expert-only; Some require crazy moves like diagonal shinesparking, just to pass through to the next area. These can all be played by people who can comfortably beat the original and aren’t too crazy. Finally, they’re all able to be played on real hardware via a romcart!!! This is definitely the first romhack any Super Metroid fan should start with! It’s basically just an enhanced version of the original with almost the exact same map. The controls even feel a bit better at times and have some features that really add to the game. At times it felt the enhancements made it a bit easier then the original, but it was an absolute blast to play! This is Super Metroid with it’s map edited to match the original Metroid game and some of the game mechanics changed; You can shoot diagonally, but you still can’t crouch. It’s basically the 16-bit version of Metroid. I absolutely loved it!!! – It saves automatically when you enter a new area. I didn’t have any problems with this at all. – If you get to a boss that’s too hard, just go searching elsewhere…there’s probably something you could have gotten that will make things easier. – Sometimes (but not always), when you save and power off the game, the “red” map data gets corrupt. I found this to be annoying and I ended up taking a picture of the map with my phone every time I left an area. – The music could be better. I wish someone would make an MSU audio hack for it! Airy is definitely more challenging then SM, but can definitely be completed by anyone who’s beat the original. I finished it in just under 7 hours at 80%, but I was taking my time and exploring and probably could have cut at least two hours out of that. – No essential item or area in the game requires special skills, like crazy diagonal spinesharking or anything like that. 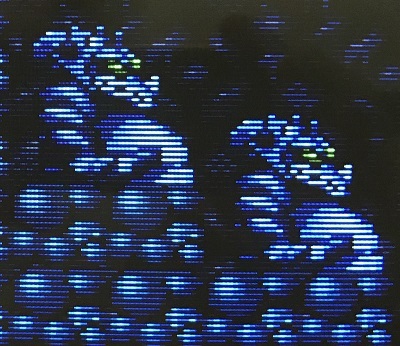 – The first boss is hard and out of order from the original SM, but I loved how doing it this way required me to learn it’s moves and compensate, rather then just blast away. There’s a few things like this in the game I really enjoyed, but don’t want to give more detail, cause I don’t want to spoil anything. – If you get to a boss that’s too hard, or an area that you’re not “ready” for, just go searching elsewhere…you’ve most likely arrived there too soon. – Once you save and power off the game, the “red” map data gets corrupt. If you’ve visited a map room, it’ll retain that info, but it won’t save any room you’ve already visited (they’ll all be blue). I found this to be really annoying and I ended up taking a picture of the map with my phone every time I left an area. – I only had to cheat once: I couldn’t figure out where to go next, so I kept searching all the areas I’d already been to. I kept finding a door that was grey – unable to be opened. I found a YouTube video of someone doing a playthrough and he walked right in. I went back to that door and it was locked. I tried everything: Made sure I killed all the enemies in the room, searched as many other areas as possible, etc, but it stayed grey for me. I went back again and randomly it was unlocked!!! I have no idea why or how this happened. It may have been a bug, or maybe I really did miss something, but once I got the item in the room, I was able to proceed to the area I wasn’t ready to enter before getting it. If I didn’t find that YouTube video, I’d probably have quit playing the game. Once again, I’m not sure if this was just me, or a bug (or if there are more bugs like this I didn’t find), but I thought it was important to mention. Overall, I really did like this hack and would recommend it to any Super Metroid fan. Legacy is a very linear game: You pretty much go from one achievement to another, without exploring, since all of the places to explore require items you don’t have yet; It’s not until the very end where you have the freedom to go anywhere. I still found it pretty fun though and completed it in about 7 hours. Important tip: If you’re stuck, bomb and shoot everything and try to find “hidden walls”, including in the ceilings. If you see anything out of place, or if you’re in an odd dead end, hit every corner of the room and the previous few rooms. Example: I got stuck in the first 5 min and all I had to do was shoot a bottom-corner of a room and drop down. This one’s a lot harder then the ones mentioned above. I was still able to beat it, but had to cheat twice and a few times had to look up where to go. I still found it strangely fun to play…it drove me insane for awhile, but I always wanted to keep going back. This one’s a 10 hour+ game though. Part of the reason it’s so long is the map is huge. Sometimes it was ten minutes just to walk from where you are to where you need to be. One good thing about the game, is there’s a bunch of “side quest” type of things (such as getting the x-ray scope) which are insanely hard, but aren’t required to beat the game. – This game was designed to be used with savestates. I played it on all original hardware without savestates and it was rough. – Even without save states, there are two parts where you’ll seriously consider GameGenie. One is awesome if you can complete it without cheating (I couldn’t) and the other is just a useless part that I didn’t feel the slightest bit guilty about cheating through. – There are no clues for where to go, ever. You’ll find yourself walking through the same rooms over and over. Bomb and shoot everything to find where to go, but you may need to cheat and download the game maps. I’m only mentioning this game, as it’s one of the most talked about SM romhacks and I definitely don’t recommend it: I tried playing this game a few times over the years and it always annoys me within the first 10 minutes each time. You’ll immediately notice that you fall much faster than in other games…as if you weight 4 times as much as normal. Also, there are NO save rooms in the game, maybe 4 total, which means you HAVE to use savestates, or be an expert. I really never get more than thirty minutes into this one, but can anyone convince me it’s worth giving it a fair chance? This is an amazing fan remake of Metroid 2: Return of Samus. It’s currently a playable beta, but definitely worth trying out! Absolutely everything was re-done from scratch, including the soundtrack (which is also available to download). I’ll make sure to post a full review when it’s finished! This is a patch the enables a debug mode in Metroid Fusion. It’s not a hack, but I thought it was worth mentioning. Well, that’s it. Please let me know if I missed a game worth playing. Also, I’d like to some day try Zelda: A Link To The Past fan hacks, but the ones I’ve seen are either really complicated, or require the use of an emulator and savestates. Hopefully I’ll eventually stumble upon one that’s as good as the original. Super Metroid (Super Nintendo Entertainment System, 1994) Authentic, working!! !